Washington's best loved museums line the East side of the National Mall, laid out between the Capitol Building and the Washington Monument. Called the "Nation's Attic," the Smithsonian Institution is one of the largest museum complexes in the world, with 30 million annual visitors, 19 museums, and over 150 million items in the collection. Each unique building is an architectural landmark all it's own. On this tour, explore how the Smithsonian Institution has shaped the fabric of the National Mall since 1855. Many of Washington's best museums and gardens can be found on the east side of the National Mall, nestled between the Capitol Building and the Washington Monument. 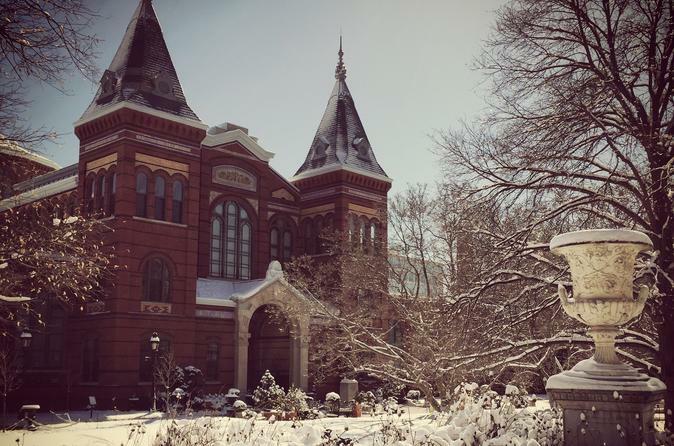 This collection of 19 museums, known as the Smithsonian Institution, is home to over 140 million items in collection. Each building holds its own fascinating story of origin, design and build. On this small-group walking tour, explore each building and learn how the architecture along the National Mall came to be. From the construction of the United States Capitol to the latest contemporary buildings, discover the design of these beautiful, historic structures and their part in building the fabric of the National Mall. The walking tour spans about two hours, covering approximately one mile of walking. Sights and museums discussed include: the Smithsonian Castle and Garden, the James V. Forrestal Building, the Arts and Industries Building, the Hirshhorn Museum, the National Air and Space Museum, the National Gallery of Art East and West Buildings, the National Museum of the American Indian, the United States Botanic Garden, and the United States Capitol Building.